For a larger resolution image, CLICK HERE and find out more about Bingo in Oshawa! Check out the amazing effort that many of the Staff and Players put into enjoying themselves at The Red Barn Auditorium Bingo in Oshawa. 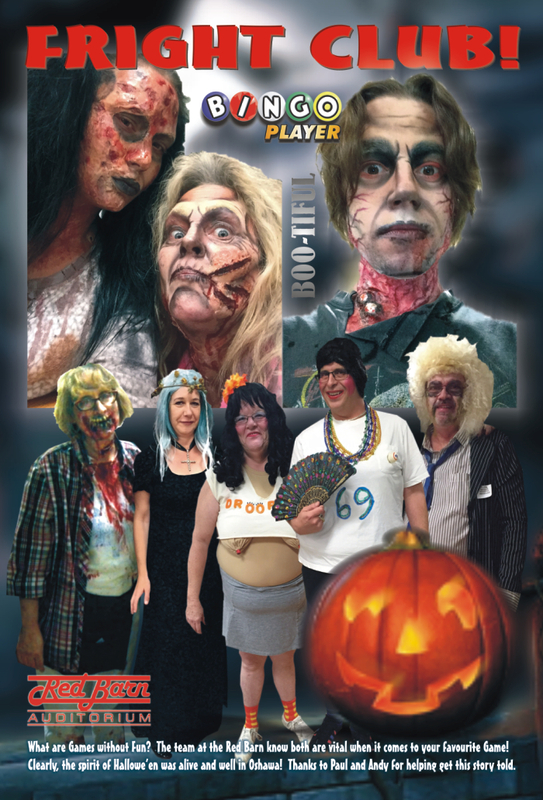 Some of the Staff spent hours in a makeup chair, making themselves look realistically ghoulish for Hallowe’en. Thanks to Paul and Andy for helping us get this story told. If this doesn’t demonstrate the commitment of Staff and Management to offer an amazing time to Players, we don’t know what does? BINGO IS NOT ONLY ABOUT RAISING MONEY FOR CHARITY, IT’S ABOUT FRIENDSHIP AND HAVING A GREAT TIME WITH FELLOW GAMING ENTHUSIASTS! Bingo Player Magazine welcomes you to 2016. We appreciate everyone who reads our printed magazine and visits us online, thanks to the support of great Bingo and Gaming locations in Ontario. We also recognize the support of the Session Sponsors and their Associations for their ongoing and strong support. We will only continue to work hard to bring you the best Bingo, E-Bingo and E-Gaming news throughout the year. We hope you experience a nice cash win playing your favourite games. THE BEST OF HEALTH & HAPPINESS TO YOU AND YOURS EVERY DAY!